These are perfect. The fit is great and oh so comfortable. I ordered my true size . Would reorder. 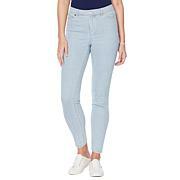 I purchased these in 3 colors for my mom and they look fabulous on her. Im very pleased with the fit and length of the leg. I would also say they run pretty true to size. Just received the pants today. I tried them they seem to give a good fit but the reason I gave them 4 stars because of the length. I am 5'5" weigh 145lbs. order a white in average length. My feet do not permit me to wear fashionable shoes--I have to wear athlete shoes or do not walk. The pants are 31" long and now I have to put out more $'s to have them shorten--1 1/2" shorter--ouch!!!! These were supposed to fit at waist but they're about 2" below which falls just below the waist fat roll. This makes them a little uncomfortable if you are hippy like me, which makes the waist band even slightly lower in the back. They fit over the legs well. Length is good, slightly longer than I like but I haven't washed them yet. I am 5'6" and weigh 156. Fabric is lightweight so nice for warmer weather. Comfortable except I wish the waist came up a bit higher. Probably won't order again. I loved these jeans but it didn't fit around my hip and thigh area correctly. Sadly, I had to return them. Elegance can be in how your put things together. 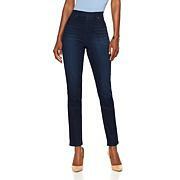 This denim pant is perfectly seamless when you coordinate it with blazers and boots, tees and thong sandals … and more.